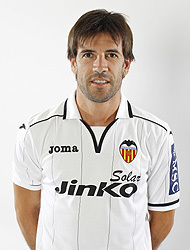 David Albelda announced that he won't be renewing his contract with Valencia CF. He announced: "My idea is to finish the season and think about other things, there is 95% chance that I will leave." "I'm thinking about going abroad, I've never played outside of Spain, but the decision can change", he added "I've always wanted to leave while I feel good". No doubt he wants to experience life outside Spain and I can see him going in Italy where his age players play all the time, maybe even England in one of the weaker teams. So there you have it, huge decision by David Albelda to not renew his contact. If he does end up leaving and there is still 5% chance that he can stay, but is he leaves it will be very hard to find a suitable replacement for him as he has been a rock at the back and has shielded Valencia's defenses perfectly for over a decade.